Make sure the USB cable is unplugged. 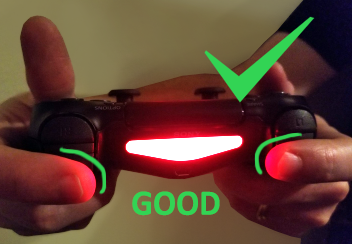 Even if the camera is in position to have a good line of sight to the DUALSHOCK 4 controller, it is still possible to degrade the quality of the tracking by partially blocking the lightbar. If you leave the USB cable plugged in, the cable can partially block the tracking light. 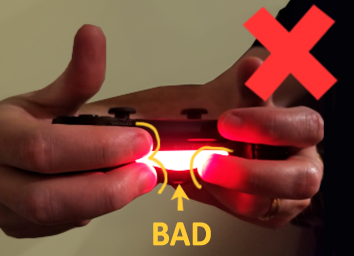 Check to make sure your fingers are not blocking the lightbar. It is possible to block the sides of the lightbar with your fingers. 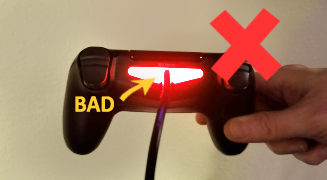 Ideally you want to place your fingers on the controller’s L2 and R2 trigger buttons.